1) In a large pot, stir fry chopped Onions in some oil until light golden pink. 2) Add Masala, Chili Powder, salt and turmeric and cook for a min. 3) Add in Tomato ketchup, chili sauce, soy sauce and ketchup manis. Stir everything and let it cook another min. 4) Add in tofu cubes, peas and spinach. Cook till spinach wilts a little. Than add in the fresh egg noodles and stir until all the ingredients are mixed in. 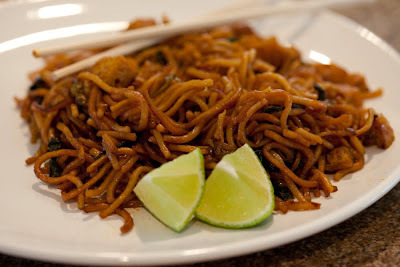 5) Taste the noodles and if more salt and spice is required, add some chili powder for spice and some salt . 6) Take a flat pan and pan fry mixed noodles lightly with a little bit of oil in batches. Note: If you like eggs, scramble 1 egg 1st and than add the noodle to pan fry. Mee goreng is now ready to eat!!! Yum Yum! !